Welcome to today's installment of Beautiful Irish Brands a series spotlighting Irish brands in the beauty industry as always I will begin by telling you about who is behind the brand followed by a product review. 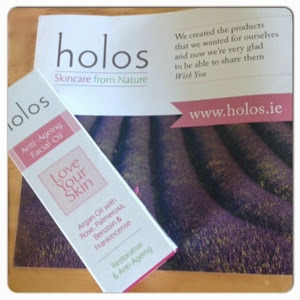 Holos is an Irish natural beauty brand from Wexford to be exact creating hand made natural products made with essential oils. Their belief is that the beauty products that we use are absorbed by our bodies in the same way as our food. so they have created these natural, healthy and environmentally friendly products that also have the bonus of luxury. Holos have got seven different product ranges Love your skin: A range suitable for all skin types but aimed towards dry and mature skin. Good Morning: A quick fix, minimal fuss skincare routine Good Night: Aimed toward balancing and relaxing you at the end of the day Blossoms: A feminine range made with Neroli, ylang ylang and my favorite smell in the world jasmine (I have my eye on this range to be my next treat) Woodlands: range for men, Happy Baby: An oil for use in the bath or massage onto babies skin and Happy Momma: products are safe to use during pregnancy and nursing. Niamh Hogan is the creative force of the brand whilst her partner Paul is the man behind the scenes. Niamh is a practicing aromatherapist and natural lifestyle practitioner, her vocation led to a passion for a natural lifestyle and essential oils which led to her creating the Holos brand initially for her own use followed by the decision to share with all of us! For my review section I was sent and have been testing Anti-Ageing facial oil from the Love your skin range. The oil combines Rose, Palmerosa, Benzoin & Frankincense with Argan oil which aims to reduce appearance of wrinkles by restoring the lipid layer of skin! -very scientific after writing that I feel like Im after travelling back to Leaving Cert Home Ec. The Rose and Benzoin are there to reduce inflammation and the Frankincense and Palmerosa keep the skin looking young by reducing fine lines. I have been using this oil every night for the last two weeks and I am really loving It. First off I adore the packaging It is in a glass bottle with a dropper for the oil so no mess yay! I really like the smell of the oil It has a beautiful rose scent that's in just the right place between subtle and overpowering. I have found that It has been aiding in me relaxing at night and Its even quite therapeutic to just apply it every night. I noticed a difference in my skin from just the first use and the effects have been magnified over the course of the two weeks. What It has done is make my skin plumper especially on my cheeks I feel like my face isn't dragging down anymore It has really lifted It. My forehead wrinkles have visibly eased and my forehead is no longer dehydrated. My whole face has been glowing, just really radiant! This was my first time to trial a facial oil and I will never be without this again. I cant believe how much better all of my skin looks and feels after just a short time. The oil retails at €22.20 and in two weeks I have used just about a quarter of the bottle this works out around €0.40 per day for spectacular skin a complete steal! Its a credit to Niamh and Holos that a product that does so much can be all natural too I'm looking forward to seeing this brand explode across the market as It deserves. 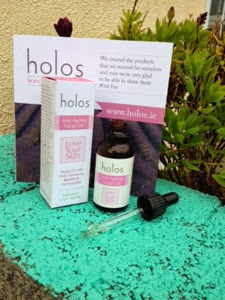 You can purchase the full range on www.holos.ie and a number of health stores nationwide. I hope you have all loved today's post please leave a comment to let me know.